Every so often, I'll decide to try HALF of a recipe. Have you ever done that? No, I don't mean reducing the quantity by half. I mean only making a portion of it. In other words, I'll take just the part that I like from one recipe and put it together with part of another recipe and boom, we have a new recipe! 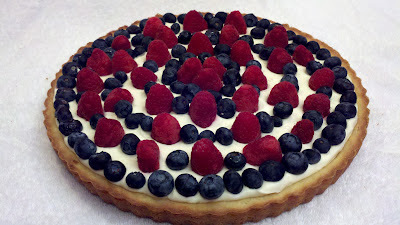 This is exactly what I did when I decided to make a red white and blue tart to celebrate the 4th of July. 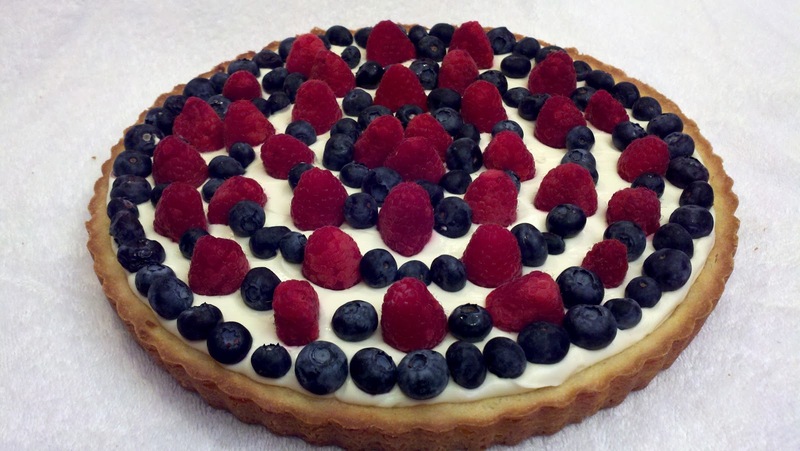 I knew I wanted to do berries and cream, but I didn't want to make just a regular pie crust. I didn't want to do a graham cracker crust either. So I decided to go to Ina's Easy Lemon Tart recipe that I posted a while back and use the shortbread cookie crust. THAT's exactly what I had in mind! It's really easy to make, it's OMG good, and it goes perfectly with a summer fruit and cream topping, perfect for your next BBQ. Btw, does anyone else mix and match recipes like this? Well, now you know one of my secrets for always coming up with something new!!! Enjoy! Beat all filling ingredients in a large bowl. Spread mixture evenly into cooled tart shell. Arrange berries on top. Chill 2 hours for easiest slicing. It's much easier to work with the crust dough if you chill it for a while before you press it into the pan. I like to use an 11" tart pan instead of an 8" or 9", so I increased all of the crust and filling ingredients by half. If you're not doing a patriotic theme, use any kind of fruits you like. Ripe peeled peaches or nectarines, kiwi, pineapple, strawberries. ALL fabulous. You could even forget the fresh fruit and top it with your favorite pie filling. Cherry pie filling would be delish!